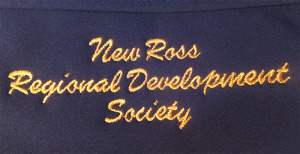 The New Ross Regional Development Society is a non-profit, volunteer organization that is a key player in the vitality, welfare and beautification of the New Ross community. Our primary focus is to improve the social, cultural, environmental and economic conditions in which we live while respecting and preserving our heritage. ‘New Ross is a vibrant and innovative rural community that values its natural environment, preserves its heritage, and has a thriving economy. We work together for the betterment of the community while enjoying a quality of life that fosters pride and prosperity’. One of our groups key projects, originated in 1993, is to host the annual, New Ross Christmas Festival, held on the first weekend of December. This is a ‘fun for the whole family’ weekend and New Ross is bursting at the seams as locals, tourists and visitors stroll through craft fairs, enjoy delicious turkey dinners, or search for the family tree at one of several u-picks. Maintain a picnic park and walking trail created for locals and tourists to enjoy. Purchased a high quality PA system for use by all community groups. Built and maintain a large bandstand, which is a focal point for the community in the centre of New Ross. Purchased and installed “Welcome to New Ross” signs at key entry points to the village. Over the past several years, we have supported and sponsored the creation of a large family of Festive Carollers, now numbering in the hundreds, which adorn our community during the holiday season. Completed the development of a Strategic Plan for the New Ross community to provide direction for future projects and plans. We welcome anyone in the New Ross area who would like to become involved with our group. Meetings are held at the Family Resource Centre (behind the New Ross Consolidated School) on the second Wednesday of each month, at 7:00pm. Please come to observe or to become a member. Copyright © 2019 The Community of New Ross, Nova Scotia, Canada. All Rights Reserved.